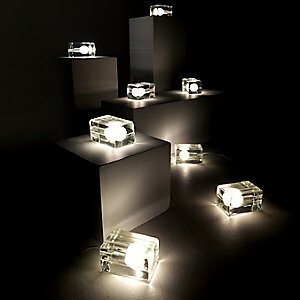 As a source of lovely ambient light, the Block Lamp also qualifies as a piece of real modern art. Created by Finnish designer Harri Koskinen in 1996, Block has since become a design classic by blending together the contrasting elements of heat and ice and a rectangular exterior with a curvaceous interior. The ice-like block is actually solid, watery-looking glass. This block acts much like a prism or cut crystal, reflecting and maximizing the sparkle of the light glowing within. This multi-faceted light will make the perfect table lamp and conversation piece in the living room, bedroom or even the bathroom. In keeping with the theme of warmth on a chilly winter day, what better gift is there?